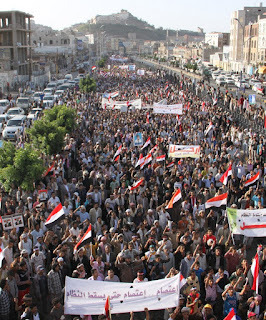 People living now in Yemen’s third largest city, Ta’iz, have endured unimaginable circumstances for the past three years. Civilians fear to go outside lest they be shot by a sniper or step on a land mine. Both sides of a worsening civil war use Howitzers, Kaytushas, mortars and other missiles to shell the city. Residents say no neighborhood is safer than another, and human rights groups report appalling violations, including torture of captives. Two days ago, a Saudi-led coalition bomber killed 54 people in a crowded market place. Before the civil war developed, the city was regarded as the official cultural capital of Yemen, a place where authors and academics, artists and poets chose to live. Ta’iz 2011 image source: https://rajaalthaibani. Ta’iz was home to a vibrant, creative youth movement during the 2011 Arab Spring uprising. Young men and women organized massive demonstrations to protest the enrichment of entrenched elites as ordinary people struggled to survive. The young people were exposing the roots of one of the worst humanitarian crises in the world today. They were sounding an alarm about the receding water tables which made wells ever harder to dig and were crippling the agricultural economy. They were similarly distressed over unemployment. When starving farmers and shepherds moved to cities, the young people could see how the increased population would overstress already inadequate systems for sewage, sanitation and health care delivery. They protested their government’s cancellation of fuel subsidies and the skyrocketing prices which resulted. They clamored for a refocus on policy away from wealthy elites and toward creation of jobs for high school and university graduates. Carapico adds that some called Ta’iz the epicenter of the popular uprising. The U.S. and neighboring petro-monarchies backed the powerful elites. 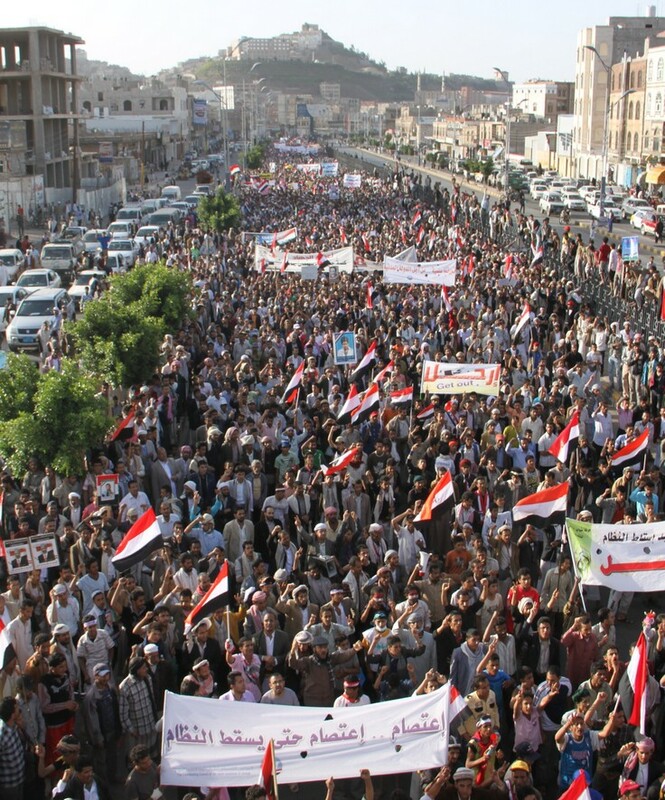 At a time when Yemenis desperately needed funding to meet the needs of starving millions, they ignored the pleas of peaceful youths calling for demilitarized change, and poured funding into “security spending” - a misleading notion which referred to further military buildup, including the arming of client dictators against their own populations. What could we wish for Ta’iz? Surely, we wouldn’t wish the terror plague of aerial bombardment to cause death, mutilation, destruction and multiple traumas. We wouldn’t wish for shifting battle lines to stretch across the city and the rubble in its blood-marked streets. I think most people in the U.S. wouldn’t wish such horror on any community and wouldn’t want people in Ta’iz to be singled out for further suffering. We could instead build massive campaigns demanding a U.S. call for a permanent cease fire and an end of all weapon sales to any of the warring parties. But, if the U.S. continues to equip the Saudi-led coalition, selling bombs to Saudi Arabia and the UAE and refueling Saudi bombers in midair so they can continue their deadly sorties, people in Taiz and throughout Yemen will continue to suffer.